It has been almost a year since the riprap armoring was removed from the shoreline of Ala Spit on Whidbey Island. 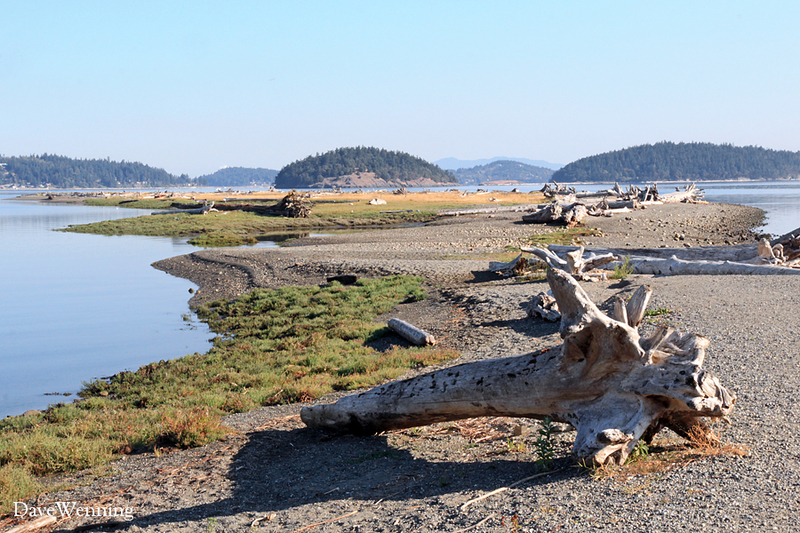 The goal was to return it to a more natural state, an effort to improve the Skagit Bay habitat for Chinook Salmon. 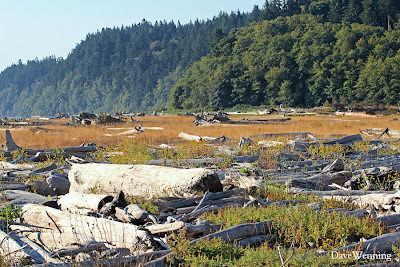 Another project was undertaken at Wiley Slough in the Skagit River delta nearby with the same goal. It is expected that the spit will now shift and change shape naturally with the currents and tides. Ala Spit is an Island County park and a popular destination for fishing, hiking, beachcombing and wildlife viewing. I visited the site almost a year ago just after the riprap revetment was removed. At the time, it still had a kind of torn-up look. The land form has now taken on natural and more beautiful shapes and contours. Large patches of green vegetation, such as American Glasswort (Salicornia virginica) above, is now growing on the leeward side. 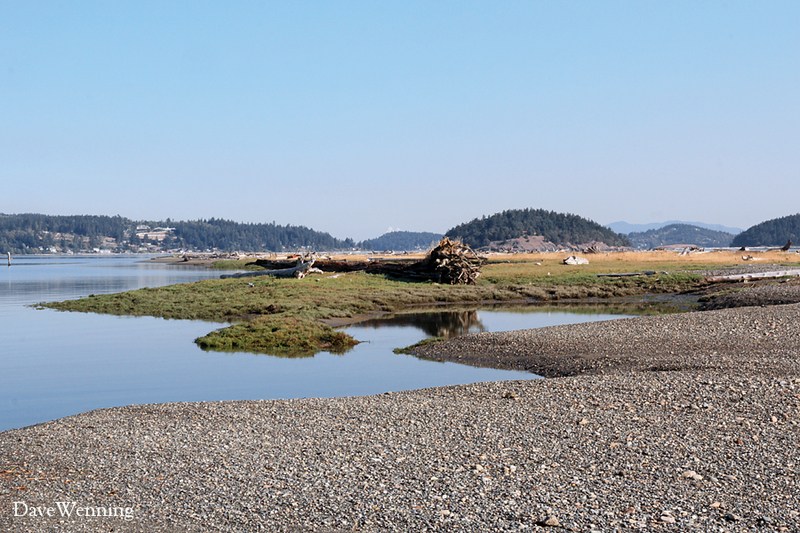 The spit parallels the Whidbey mainland to form a lagoon and pocket estuary (pdf). After hatching in freshwater streams, young salmon will spend up to three years in these sheltered waters. They can grow here protected from predatory fish. The salinity in the bay is reduced by river flow and fresh water runoff from the land. This helps the fry adapt to salt water before venturing out into the open ocean. Destruction or alteration of these important habitats has been identified as a factor in the decline of the Skagit run of Chinook Salmon. Another view of the sandspit shows some effects of tidal action. To me, the eroding material actually looks like artificial fill left from last year's alterations. During windstorms and extreme high tides, the spit will be completely inundated. Accumulating driftwood provides an important natural armoring against erosion. 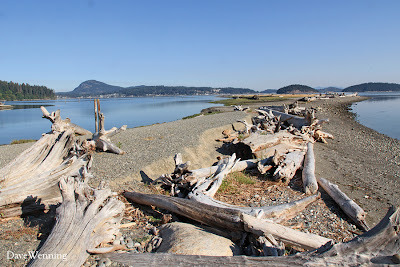 Driftwood should never be collected, disturbed or burned in sensitive areas like this. 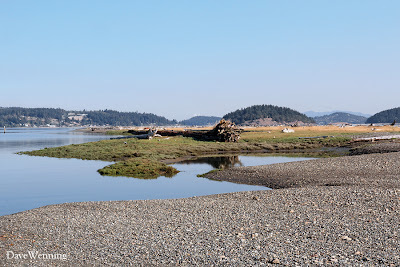 The lee or sheltered side of the spit has a convoluted shoreline with small tidal pools along the edge of the lagoon. The windward shoreline has a smoother, more unbroken contour. 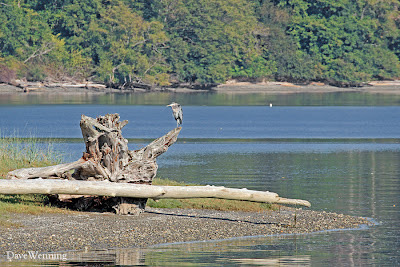 The young salmon in the lagoon may be protected from predatory fish, but not from birds such as the seafood-loving Great Blue Herons who patrol the shallows. Only the fastest and smartest of the baby fish will survive. 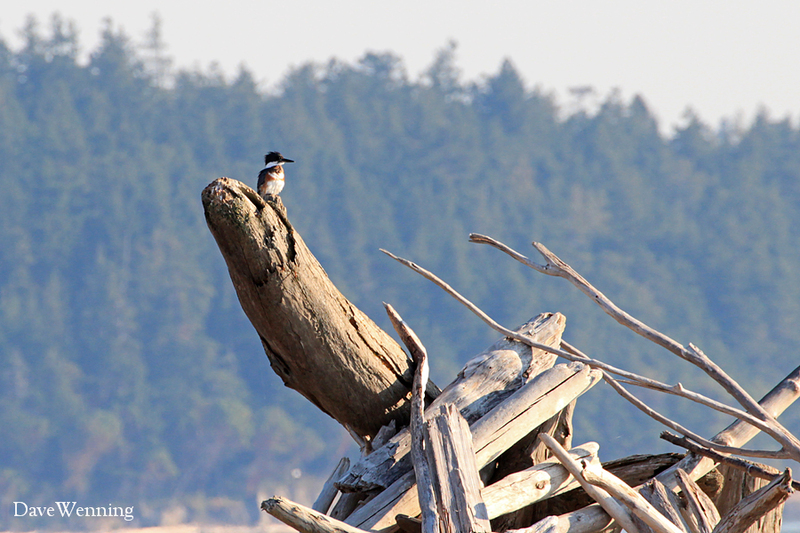 Ala Spit is a great place for spotting shorebirds. Left, a Belted Kingfisher, another skilled angler, takes a pause from fishing. Their chattering calls will be heard before they are seen hovering over the water to spot fish. It's a ratcheting sound iBird describes as like a heavy fishing reel. Right, this Glaucous-winged Gull still has a bit of black on the beak. They take four years to mature to adulthood. 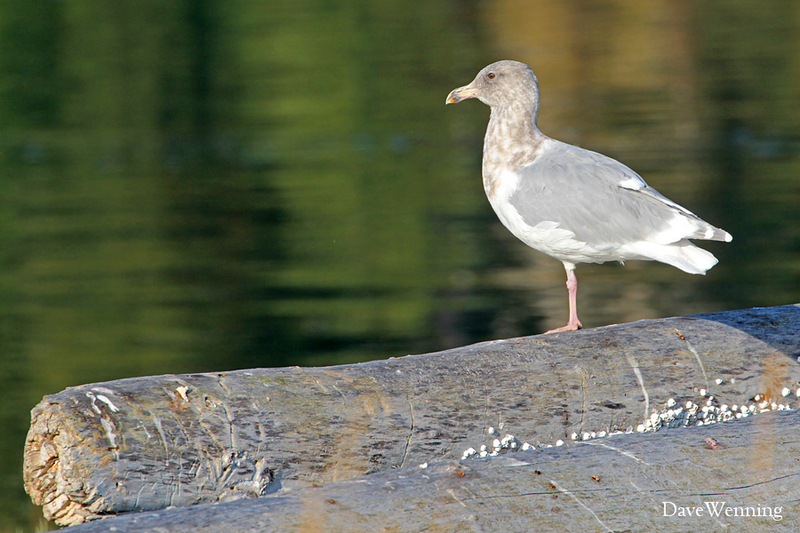 Gulls have the habit of standing still like this, as if posing, which makes them great photo subjects. Left, Double-crested Cormorants, identified by orange at the base of the bill, will perch to rest, preen and dry their feathers after diving. 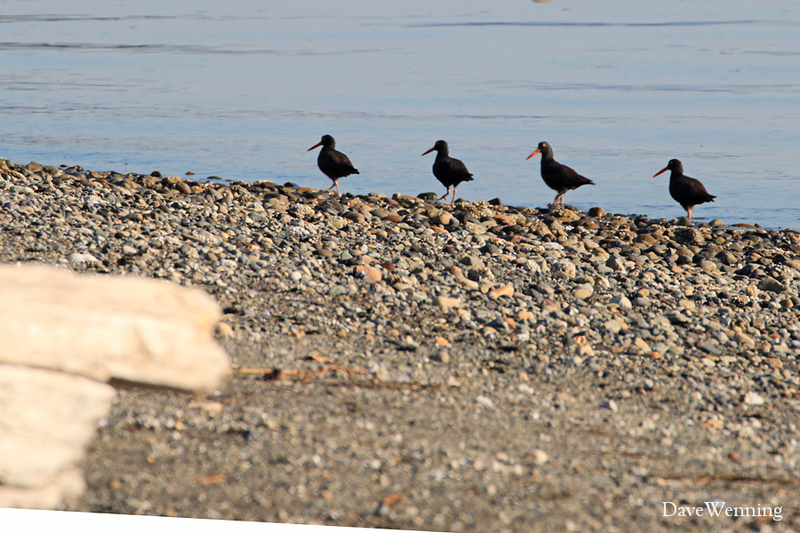 Right, this column of Black Oystercatchers makes me think of the "Colonel Bogey March" from the film Bridge on the River Kwai. Are you old enough to remember that great movie moment? Left, patches of Sand Verbena (Abronia latifolia) are blooming profusely. They like to grow on protected salt-water beaches and sand dunes. 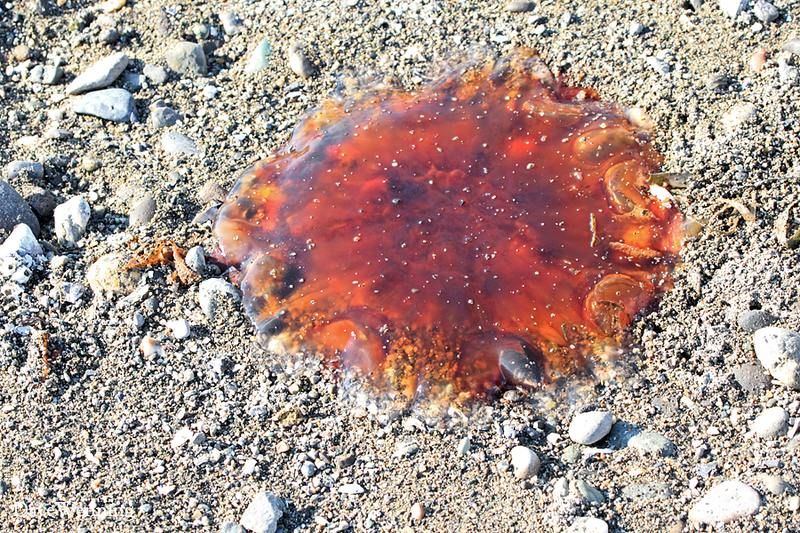 Right, a Lion's Mane Jellyfish (Cyanea capillata) appears to have been stranded by the tide. Actually, they naturally start to die off this time of the year due to bacterial infection and a dwindling food supply. 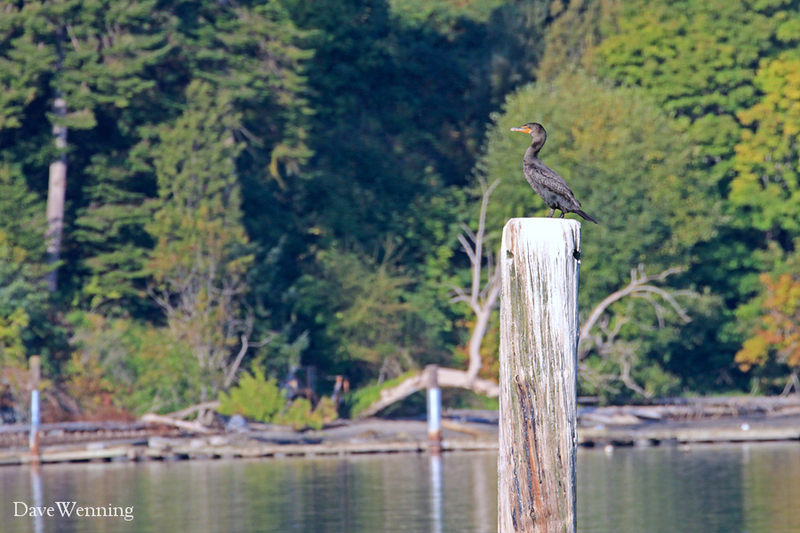 They are creatures of the open ocean that routinely get washed into the Salish Sea which includes Skagit Bay. This one was about a foot across, but some may exceed two meters in diameter. The outer end of Ala Spit is a vast driftwood field. Besides armoring against erosion, driftwood fields provide habitat for wildlife and leach valuable organic nutrients into the surrounding water. Click on the photo to enlarge it. The yellow flowers blooming around the driftwood are Entire-leaved Gumweed (Grindelia integrifolia). 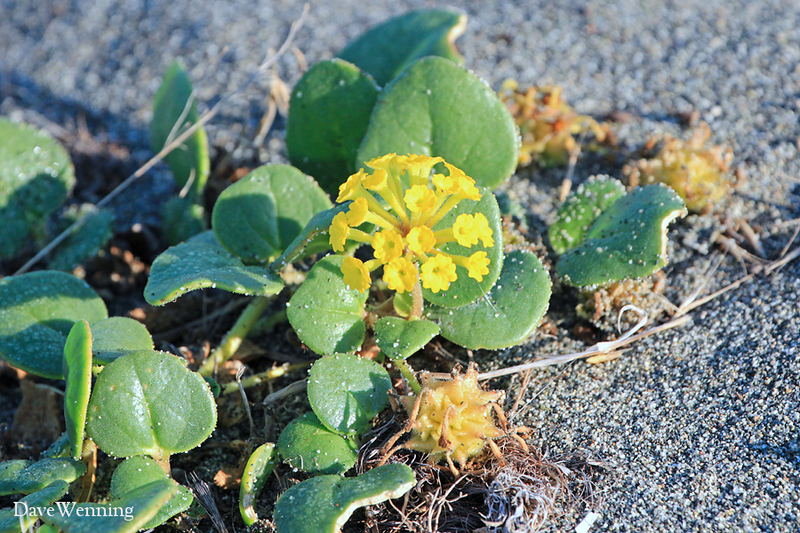 This is another native flower seen growing on beaches and around salt marshes. The Dewey Beach community on Fidalgo Island is seen from the end of Ala Spit. 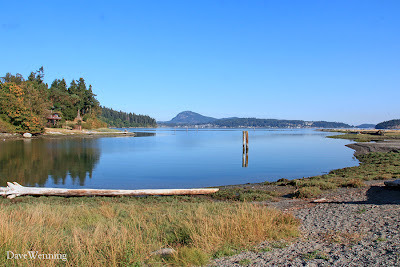 On the left is Hoypus Point on Whidbey Island marking the entrance to Deception Pass. 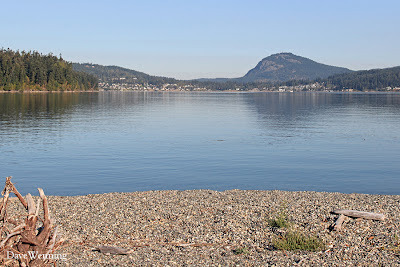 The peak is Mount Erie, Fidalgo's highest point, with its two communication towers at the summit. For other accounts of visits to Ala Spit, see "The Eagles of Ala Spit" and "Pecking Order" at Wild Fidalgo.